TWOQC programs are offered to club members and first-time attendees only. Get ready! September 17-19 will be the 22nd Honor Flight to Washington, DC for WWII, Korean War and Vietnam Veterans from the Tucson area to see the war memorials. Every 90 seconds a WWII veteran dies and most will never have the opportunity to see the Washington, DC memorial dedicated in their honor. The Tucson Honor Flight team has requested that the residents of Quail Creek and TWOQC write generic “to a Vet” letters to the Veterans traveling on this flight. This is our opportunity to thank the veterans for their service. During the return trip, veterans are surprised with “mail call”. The letters given during “mail call” are very meaningful and a blessing to each veteran. Please start writing! Letters may be delivered to Kay Robinson, 898 N. Kenneth Drive by August 29 or to TWOQC August program. Questions? Call Kay at 495-4173. Come to the Tucson airport September 17 by 5:30am to see the veterans off at the Southwest Airlines area and/or welcome them home Monday, Sept. 19 at 8:00pm. This is a very emotional and patriotic opportunity. Names of vets scheduled to take the September 17 flight are in this LINK. Thanks to all who brought donations for the homeless and hospitalized veterans to the July Monday night program. Peggy took 11.6 lbs. of toiletries to the VA on August 3. She also had a carload of men’s clothing generously donated by two recent widows. Both said they felt their husbands would have wanted their clothing to go to the veterans. If you are starting to get more 2017 calendars in the mail than you can possibly use, rather than throw them in the trash or recycle bin, please save them for the hospitalized veterans. Those being hospitalized long term and those living in the nursing home facility really like getting them. Coupons for the National Guard should expire September 18 or later. Coupons destined for overseas should expire July 1 or later. Are you on Facebook? If you answered ‘yes’, then you have seen the nearly 50 posts on TWOQC’s Facebook page just since early March. If you said ‘no’, then you’re missing out! TWOQC having a Facebook page means FREE advertising. Why advertise? We are proud of who we are, what we accomplish, and our impact on the community. Sharing this information through social media is the best way to engage our community, far and wide, so that others can also participate in our community efforts and events. To expand our presence, we depend on our visitors (and our members!) to LIKE and SHARE our posts. Here’s an idea if you aren’t on social media and don’t plan to have a Facebook page: Please ask your family, friends, and neighbors that are connected to Facebook to find and support our page (“like” and “share” the page and posts). 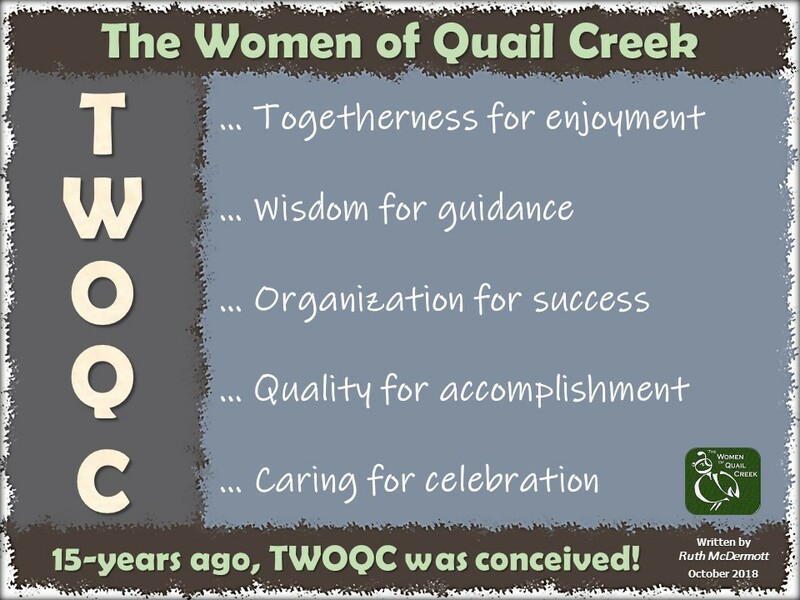 To find TWOQC’s page, login to your Facebook account and search “Women of Quail Creek”, or click here: Facebook.com/twoqc. Many thanks to our members and community who have actively supported our Facebook page.